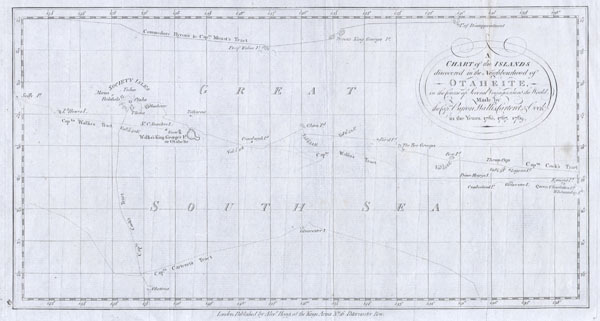 A Chart of the Islands discovered in the Neighbourhood of Otaheite, in the Course of Several Voyages round the World Made by the Capts. Byron, Wallis, Carteret, & Cook. This is a rare map of the Society Islands in the South Pacific published by Alexander Hogg to illustrate the voyages and discoveries of the sea captains Byron, Wallis, Carteret ad Cook. This map contains references to the cartographic work of John Hawkesworth (1715?-1773), James Cook (1728-1779), Sir Joseph Banks ( 1743-1820) and John Byron (1723-1786). Features the routes taken by these important explorers in and around the Society Islands. Depicts the island of Tahiti (Otaheite) as well as Bora Bora (Bolabola), Otaha, Marma, Ulietea, and others. Decorative title cartouche in the upper right quadrant. Published for Hogg's account of Cook's Voyages, c.1780. Alexander Hogg (fl. c. 1778-1824) was a London based book, map, and print publisher. Hogg is best known for his publication of the journals of James Cook, but he also published a number of local plans focusing on the British Isles. His offices were based at no. 16 Paternoster Row, London, England. An account of the voyages undertaken by the order of His present Majesty for making discoveries in the Southern Hemisphere, and successively performed by Commodore Byron, Captain Wallis, Captain Carteret, and Captain Cook, in the Dolphin, the Swallow, and the Endeavor. Drawn up from the journals which were kept by the several commanders, and from the papers of Joseph Banks, Esq; by John Hawkesworth, LL.D. In three volumes. Illustrated with cuts, and a great variety of charts and maps relative to countries now first discovered, or hitherto but imperfectly known. London: printed for W. Strahan; and T. Cadell in the Strand, MDCCLXXIII. Rumsey 3403.033. David, A. The charts and coastal views of Captain Cook's voyages, 1.73A; Mitchell, 860.